Release Party of “Monster Rion”, the unit by SONPUB & The BK Sound! 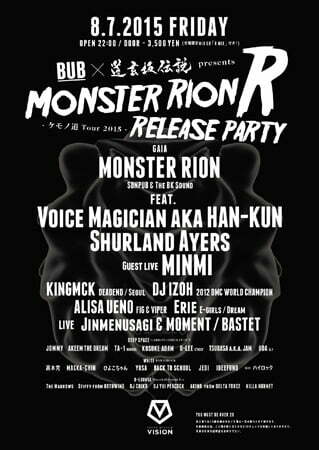 In addition to “Monster Rion”, this party will feature Voice Magician aka HAN-KUN, Shurland Ayers, and MINMI as guest live artist. Only “Monster Rion” can book this amazing line-up. SONPUB is top dance music producer and DJ. This line-up represents their musical identity. Also, this party will be organized by legendary big party crew “BUB” and “DOGENZAKA DENSETSU” (The Legend of Dogenzaka). This is incredible collaboration! They will also bring KINGMCK who leads Korean street culture, IZOH who is DMC WORLD CHAMPION, ALISA UENO who is charismatic female model, Erie of E-girls who is super-popular pop star. This line up is shocking!